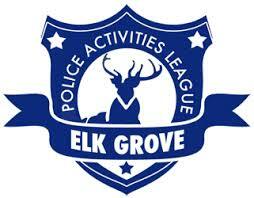 Even though it no longer exists as a functioning organization, the Elk Grove Police Activities League recently had a lien placed on it by the State of California. The lien, file no. 20160613-0117, was recorded on June 13, 2016 at the Sacramento County Recorders Office. The lien was issued by the Labor Commissioner, Division of Labor Standards Enforcement, Department of Industrial Relation for the State of California. According to the document, the lien was placed on behalf of Kendra Lewis, claimant and plaintiff. The lien states "The Elk Grove Police Activities League, Inc., ...owes wages, damages and penalties in the amount of: $16,251.74 as ordered and awarded by the Labor Commissioner under Labor Code sec. 98.1, which is now final. "(see image below). A records search at the Recorder's office revealed the EGPAL had four separate liens imposed on it between 2012 and 2015 totaling $5,020, inclusive of interest and penalties. Three of the liens were placed by the California Employment Development Department and one by the Board of Equalization. All four liens were subsequently released. The EGPAL, which is not part of the City of Elk Grove nor the Elk Grove Police Department, has disbanded. 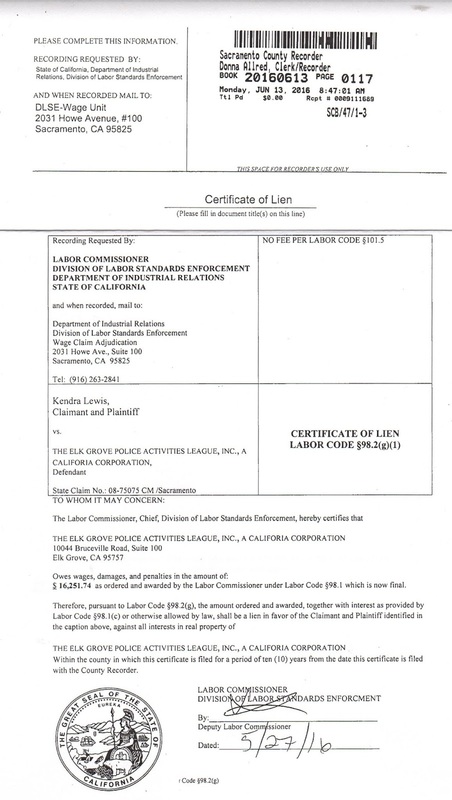 Lewis, who is the claimant on the lien, was a former employee of the EGPAL. The current address of the EGPAL listed on the order is 10044 Bruceville Road, Elk Grove 95757. In previous years the EGPAL had garnered ten-of-thousands of dollars in grants and was consistently among the largest receipts of community development grants awarded by the City of Elk Grove. Last year Elk Grove Police Chief Robert Lehner ordered an audit of the organization's finances. The report, which discovered many deficiencies, can be viewed here.